Range Extenders: Junk? Do they work? I have 4 range extenders--I had removed them as they were always reporting low signal, drop out, etc. After a bit of time, I decided to re-pair one the other day and after a few hours it goes to low signal..I called Iris tech support--after a reset and repair, it seemed OK--now it is back to "Low Signal" and it is 22 feet away from the hub. Do these things even work? # of these are model REP800, one is model SPG800. I don't use the SPG800. I've never been happy with these range extenders--especially since I see no change whatsoever in my system using them. Does anybody else have such issues with RE? I pulled it out once and shortly after my garage tilt sensor dropped off it came back when I re installed the range extender so I concluded it was working. My question is ... If it's connected but low signal, does that even matter? I know this makes NO SENSE at all, but I was having the exact same issue with the low signal no matter what I tried. Would be great after re-adding to the system then drop to crap again. I moved the range extender further away and behind a toaster oven on the other side of the kitchen sink, to another outlet and I haven't had a single problem with low signal or low battery since. It has been over there for at least 4 months now. Try a different outlet somewhere else in the house and see if you have the same results. How many devices do you have? It's my understanding that if you have a large mesh network they're not even needed. I only have about 12 devices now as I took all of my "security" stuff off such as keypad, door sensors, etc as I no longer trust Iris as a viable security system. The main use I have for Iris now is strictly home automation such as turning lights on/off, 4 Schlage deadbolts (2 on Iris, 2 on Wink), dry food feeder for cats, etc. Tech support says if RE keeps dropping to low signal that I should replace it--I just bought one of these 2 days ago. Also said the one SPG800 is the old RE and not recommended to use. I feel like packing all these REs up and returning them to Lowes as they still have some of the old SPG800 RE on the shelves in a coupleof stores in my area. As for need of a RE, I get tired of the sometimes sluggishness of Iris on unlocking deadbolts---39 seconds is too long. The one Iris lock closest to hub is quicker at times. I assumed a few RE would help reaction times on the 2 Iris deadbolts. Curious as why you don't trust IRIS to do home security? After being used to a Linear system that was monitored which I had and wish I still had, I jumped too early on the Iris bandwagon for home security. Various flaws in the Iris system have turned me off for using it as a security system. Door & window sensors have no way of being screwed to doors and jambs except with the supplied Command adhesive, no adjustment for them on the magnet side to accommodate various size door jambs & thicknesses--it's not pleasant to be awakened by an Iris alarm because the Command adhesive loosened in the night and the sensor fell off tripping the alarm. Iris "motion" detector too easily tripped with no adjustment for pets, keypad doesn't require a code to arm it like it does to disarm it, annoying noise when arming & disarming, speaker in hub and not external...as I have said in the past, IMO, Iris seems like a discount "cheesy" security system. My old system had true motion detectors, glass break sensors on each window, heat detectors as well as smoke, backup battery power, loud external siren, etc.--and this was all wireless too, but not Z wave--if Internet was down and electric lines were cut, my old system still worked on 12V backup...it was fast and not sluggish on response time. As we know, Iris can be clunky. Don't get me wrong, I like Iris...I love it for home automation but I hate it for home security. I myself would not trust my life, property, and assets to it to be a dependable security system, but again that is my opinion. Iris to me is just a toy to play with for home automation. I agree with all you said except the sensors can be mounted with a screw, there are marked positions for holes to be drilled through the plastic if that's your preference. In my case I did not really need the security side but after adding dozens of sensors for automation I decided to add the security which only required a couple of sirens and keypads. I'm still tweaking it all using magic and the new IrisPlus app along with Tasker, the API and IFTTT to bring it all together. Jumping back to the OP for a bit. The Iris RE is inconsistent in my opinion because of a very poor antenna design. It is a “hit or miss” depending on your system. Moving the RE a few feet or to other side of a room or hallway will deliver huge changes. The purpose of a RE is to help support devices that are located further away or located in difficult EMI locations. Instead in most cases other Z-wave extenders are supporting the Iris RE. Note: The issue with the Iris RE is with Z-wave. The Zigbee repeater/multiplier appears to be operating as expected. My recommendation would to not use the Iris “RE”. Any of GE/Jasco/Linear “modules” will be far superior to the Iris design. Keep in mind any device that has to mounted “in wall” will have reduced performance but usually still far better than than the Iris RE. Note: Devices mounted in metal junction boxes will have their range reduced dramatically. The modules that just plug into the wall are your best option if you are having Z-wave range issues. Show any 10 year old Ham Radio Operator the antenna design in the Iris RE and they will be able to explain why the paper clip folding back on itself design is an extremely poor design and likely the cause of the “hit or miss” performance of the RE. This design will cause nodes causing drop out / weak areas of performance. Depending on local EMI your performance will vary greatly. NOTE: The poor design will be most evident when users do not have other Z-wave repeaters online. Lighting modules, thermostat when using the “C” wire and the best Z-wave repeater at the moment, the LInear garage door opener. When additional Z-Wave repeaters are online they will support the poor antenna design of the Iris RE. While the Iris RE is not completely useless (Zigbee extender/multiplier & for Z-wave if it is in the “spot” or has supporting Z-wave extenders near by), if you are having Z-wave range issues try other RE options. Thanks for the in-depth explanation OHTRTA. That now explains why once again my 2 REs that I spent time with Iris support a day or so ago are now again low signal. My thermostat is Nest and doesn't use a C wire so I can't get any help there. I think I'll just take what REs I can back to Lowes and chalk it up as experience. 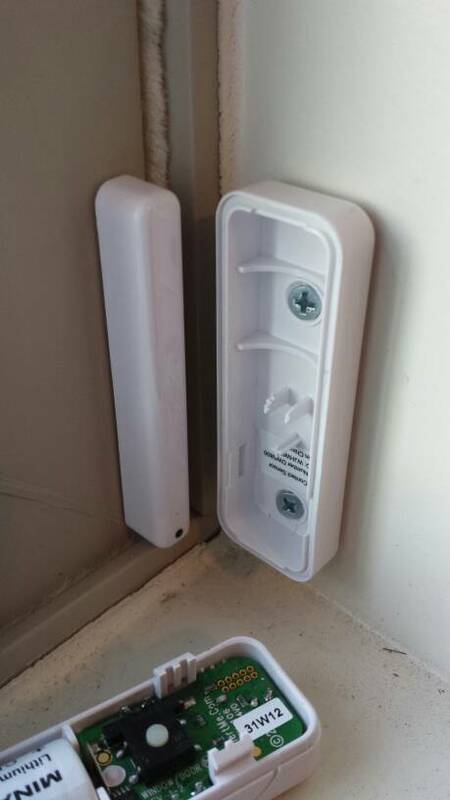 And for the door sensors, the sensor itself does indeed have screw holes but the magnet itself is so small you must use some type of adhesive as I never could see how the magnet case could be dismantled easily without breaking. Iris should have an adjustable sliding mounting bracket for the magnet so that it could be adjusted to stick out farther or closer to match up with the contact itself. The Command adhesive strip on the magnet portion is so narrow that actual contact point on door jamb is minimal--that is actually what has fallen off a couple of my doors in the past, plus a sensor itself a time or two as well. Maybe Lowes/Iris monitors this site and takes into consideration some of our comments for improvement. I've opened the smaller magnet piece and you can also screw it down. The magnet is just that so you can use the old magnet side of your previous system or buy just that portion if you have a unique setup. Also red 3M tape will hold it maybe some glue depending on what you need. Just the fact that Iris has no tamper detection at all is enough in my opinion Get to the hub, open it, remove battery and power - and there you go. All within the entry delay. There is some RF Jam example http://www.cnet.com/news/can-burglars-jam-your-wireless-security-system/as well. Except the user will get notification of lost of internet connection.......... no system is perfect. But for "Joe Sixpack" user Vs. "Joe Sixpack" robber the Iris system will be just fine. I am not sure the antenna design or the placement is the reason for the poor RF performance of the RE. I have found that moving the RE to a higher receptacle like a kitchen counter makes a significant difference in RF performance over the typical 12-18" receptacle height. There's not a lot of antenna design option available for such a small package. The antenna in the RE has an omnidirectional pattern with a flattened top lobe which if visualized would look like a doughnut. It's also able to receive on both horizontal and vertical polarities, a design that is important because the REs have to be able to work in any orientation with devices that might not be on the same plane. Antenna design is a very exacting science. Companies spend huge sums of money measuring performance in special non-reactive RF test chambers. I somehow doubt the REs were thoroughly tested and optimized for the best performance as they should be. Every 10 year old ham operator knows enough to test his antenna before hiking it up to the roof! Thats the problem, by folding back on itself makes a non-omni directional design and causes the nulls thus the drop outs. 900 Mhz is still low enough moving a device several feet should not change the operational characteristics as it does. The problem is likely a digital engineer allow the antenna design to proceed. No RF engineer would design single ended antenna design back on itself. When was the last time you have seen a vertical antenna design folding back on itself unless it was attempting to achieve a particular polar pattern? They could have use a micro strip antenna that for example is used in the Aeon Z-wave repeater which outperforms the Iris RE greatly. Or check out any of the other antenna designs that GE/Jasco or Linear is using which as well outperform the Iris version. Everyone is basically using the same Z-wave chip and board which has everything built in. The only real difference is the antenna design. I called support the other night about my Range Extender. He told me the low signal didn't really mean anything. 3M strips and that stuff can cause some real damage while trying to pry it off. They must be breaking in some new folks. Low Signal means the Z-wave portion of the RE is most likely not connecting to the hub. If you move the RE back within 5 to 10 feet of the hub the low signal will likely disappear. If not I would recommend removing and repairing the RE. The low signal usually occurs once you move the RE after pairing. NOTE: If you have additional Z-wave repeating devices they usually work better than the Iris RE and end up supporting the Iris RE. Z-wave can handle up to 232 devices per hub. There is a limit of how many "hops" / how many times a Z-wave signal can be "repeated". That number is 4 times with hub counting as the first "hop". Zigbee on the other hand theoretically can handle 64,000 nodes. But at least with the Iris system it is recommend to have a Smart Plug and/or an Iris RE for every 16 or so Zigbee devices. Before the old timers hit reply, yes I have seen some systems have 18, 19, the most I have seen is about 22 Zigbee devices without a SP or RE. But at some point the system will not allow you pair any additional Zigbee devices until you add a Smart Plug and/or RE and that number is around 16 Zigbee devices. NOTE: So yes, this means the Smart Plug and Iris RE are actually a "range extender" as well a "network multiplier" for adding additional Zigbee devices. If you are using some type of two sided tape and need to remove I would recommend using an hair drier or heat gun to slightly warm up the tape before attempting to remove the device/tape.